LMS Theory | Women are attracted to men with LMS – Looks, Money and Status. Women are attracted to men with LMS – Looks, Money and Status. Women are attracted to masculinity that includes looks as well as status and money (power). 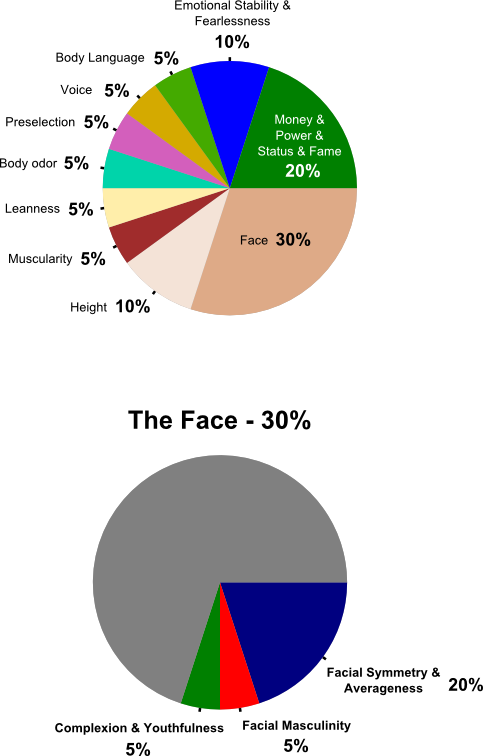 Here is a percentage breakdown on the qualities which influences a man’s sexual attractiveness. If you have a symmetrical face and facial averageness, add 2 points. If you have an asymmetrical face, subtract 4 points. If you have a highly masculine face, add 0.5 points. If you have an emasculated face, subtract 1 point. If you have red/yellow skin tone, no pimples, an even skin tone and youthful skin, add 0.5 points. If you do not have red/yellow skin tone, pimples, blotchy or aged skin, subtract 1 point. If you’re 6 feet or taller, add 1 point. If you’re less than 5 feet 8 inches, subtract 2 points. If you’re muscular, add 0.5 points. If you’re scrawny, subtract 1.5 points. If you’re lean, add 0.5 points. If you’re overweight, subtract 1 point. If you have good posture, movement and gait, and a relaxed facial expression, add 0.5 points. If you have bad posture, movement or gait, and a tense facial expression, subtract 1 point. If you have a deep, smooth, relaxed, guttural voice, add 0.5 points. If you have a high-pitched or tense voice, subtract 1 point. If at least 20 women are attracted to you, add 0.5 points. If no woman is attracted to you, subtract 1 point. If you frequently feel angry, subtract 0.2 points. If you frequently feel embarrassed, subtract 0.2 points. If you frequently feel fearful, subtract 0.2 points. If you frequently feel guilty, subtract 0.2 points. If you frequently feel insecure, subtract 0.2 points. If you frequently feel worried, subtract 0.2 points. If you frequently feel nervous, subtract 0.2 points. If you frequently feel jealous, subtract 0.2 points. If you frequently feel sad, subtract 0.2 points. If you frequently feel lonely, subtract 0.2 points. If none of the above traits apply to you, add 1 point. You frequently make an effort to avoid situations which make you feel embarrassed. You frequently make an effort to avoid confrontations or being a nonconformist due to fear. You frequently make an effort to be extra nice to others so you won’t feel guilty if you hurt another’s feelings. You frequently make an effort to improve your appearance, status or behavior, seek other’s approval, act pretentious, or brag about yourself to avoid feeling insecure. You frequently make an effort to check over stuff and complete things on time so you would be less worried. You frequently make an effort to avoid situations which make you nervous. You frequently make an effort to control your partner’s sexual access to other men so you won’t feel jealous of your partner. You frequently make an effort to avoid situations which make you sad. You frequently make an effort to seek companionship or attention so you won’t feel lonely. If none of the above applies, add 1 point. If you are a nerd, subtract 1 point. If you have the ability to give orders to 10-30 people, have an income between $70K and $100K, or have 500 to 2,000 friends/followers who pay attention / look up to you, add 0.5 points for this section. If you have the ability to give orders to 30-100 people, have an income between $100K and $200K, or have 2,000 to 10,000 friends/followers who pay attention / look up to you, add 1 point for this section. If you have the ability to give orders to 100-1,000 people, have an income between $200K and $500K, or have 10,000 to 100,000 friends/followers who pay attention / look up to you, add 1.5 points for this section. If you have the ability to give orders to 1,000-10,000 people, have an income between $500K and a million, or have more than 100,000-1,000,000 friends/followers who pay attention / look up to you, add 2 points for this section. If a trait is above-average, add one point. If it’s below average, subtract three points. This is because it takes three above-average traits to compensate for a below-average trait. It’s like how pain is more intense than pleasure. If someone insults you, it takes three compliments from the same person to make you feel better. The same exists with a man’s height. If he’s short, then he must have three above-average qualities in other areas for him to compensate.